Afro-Tech Girls is a Non-Governmental Organisation, founded in June 2014, that is focused on encouraging, educating and empowering young African girls that are interested in the Science, Technology, Engineering and Mathematics (STEM) industry. In conjunction with the Lagos State Electricity Board (LSEB), Afro-Tech Girls is bringing 20 girls the opportunity to attend a Renewables Bootcamp Day on Thursday 11th of June 2015 at the LSEB grounds,Ikeja. The bootcamp day will involve activities like: a tour of the Lagos Solar Project prototype and Mainland Ikeja Independent Power Plant, tutorials on solar energy by RENAC trained solar trainers, fun hands-on experiments with a solar training kit and so much more. We would love the participation of girls aged 11 to 18 currently residing in Lagos. 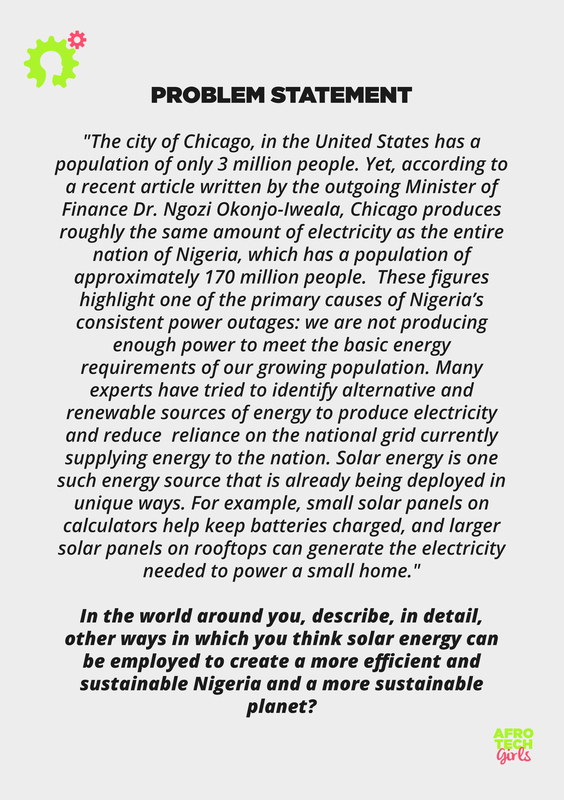 We believe it would be a great opportunity for them to gain a broader understanding of renewable energy as well as hands-on experience, which is ever so valuable to their developing minds. To gain the chance to participate in this very insightful day, all you have to do is write a short essay (300-350 words) based on a problem statement, which you will find attached. The deadline for the essay is Sunday 7th of June 2015. 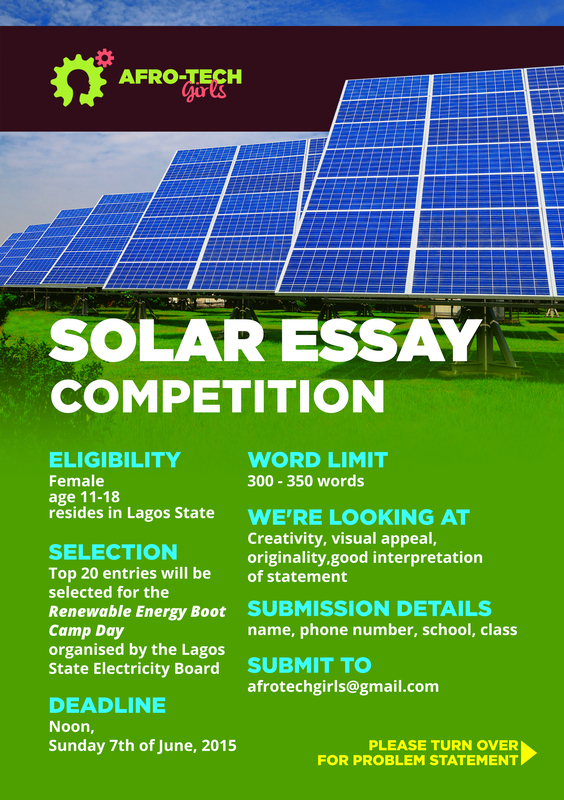 Due to the very short timeline, only electronic copies of the essay will be accepted and entries can be sent to afrotechgirls@gmail.com with the title “Essay Entry for LSEB Solar BootCamp Day”. Successful entries will be contacted by Monday 8th and Tuesday 9th of June 2015.